"We're them. We're they. We're the Men In Black." As far as worthwhile summer blockbusters go, the 1997 sci-fi comedy Men In Black is definitely in the running as one of the better ones of the bunch. I find a lot of the summer popcorn films like Independence Day, The Rock, Jurassic Park II, Armageddon, Con Air, and Wild Wild West to be not much more than exercises in noisy, emotionless excess, while director Barry Sonnenfeld (who coincidentally helmed the aforementioned Wild Wild West) managed to score big with a special effects-laden outing that was crammed tightly with humor and action; not surprising, it was a huge money-maker, and deservedly so. The Limited Edition DVD release has become increasingly hard to find of late, so Columbia has assembled this groovy mass-produced 2-disc Deluxe Edition, designed more so to shrewdly coincide as a marketing tool for the release of the sequel Men In Black II in summer 2002. If you've been in a cave for the last few years, I'll give you a quick recap. MIB operates under the premise that aliens from other planets live and work among us on Earth, and that a secret branch of the government has been created to monitor their comings and goings. Tommy Lee Jones is K, a seasoned MIB who recruits New York City cop James Edwards (Will Smith) to join the ranks of the ultra-secret organization. Edwards becomes J, and the two find themselves with the fate of the world in their hands. When a nasty bug from a distant planet arrives on Earth with plans of destruction, it takes up residence inside the skin of abusive hick Edgar (Vincent D'Onofrio), and it goes on the hunt for a hidden galactic treasure. It is then up to the MIB to track it down to save the world from complete and utter destruction. Based on Lowell Cunningham's sinisterly dark Men In Black comic, the screenplay was written by Ed Solomon, the same guy who barfed up the ineptly moronic Charlie's Angels in 2000. The humor here is actually well-written (for mindless escapism, that is), and doesn't necessarily pander to an eight-year-old's mentality. Some of the jokes are cleverly layered, with some of the humor underplayed almost to the point of subtlety: I loved the idea of having an illegal space alien disguise itself as an illegal Mexican alien to avoid detection, a concept that would likely sail well over the head of younger viewers. The Solomon script retains a lot of the bite from Cunningham's comic, and Tommy Lee Jones delivers his lines with a perfect deadpan. What is a summer blockbuster without a crapload of razzle-dazzle effects? Not much, I'll tell you that. 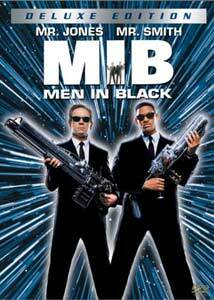 MIB's got 'em, and Sonnenfeld and company have included an array of visually exciting special effects as anchors for the action sequences, all of which still hold up exceptionally well. The creative minds at Industrial Light and Magic, as well as makeup god Rick Baker, combined forces here for some truly outstanding visual effect shots. It helps that Sonnenfeld seems to have had really hit his directorial stride with MIB, at least in terms of effects-heavy action comedies. The action scenes mesh naturally as extensions of the plot, and never really seem like a string of standalone set pieces simply designed as cinematic eye candy (like the giant mechanical spider from Wild Wild West). Aliens explode into piles of blue goo, they regrow heads, scale buildings, transform into monstrous beasties, and interplanetary spaceships crash land magnificently; even the MIB office is a marvel of snazzy high-tech contraptions contained in a hip and retro 1960s style set. There is a ton of CG and latex puppet aliens wandering about at any given moment, and they make the Star Wars cantina scene look like a high school production. Just in terms of stunning visuals accomplishments, this is what Ghostbusters could have and would have looked like if it had been made fifteen years later. This new 2-disc Deluxe Edition is a blast, and should be a required purchase for all of you who missed out the Limited Edition. I know this re-release is a hollow marketing shill for the upcoming sequel, but I can live with that. The movie itself is a heck of a lot of fun, and that's what it's all about. Image Transfer Review: As on the prior releases of MIB, Columbia has dished out the same 1.85:1 anamorphic widescreen transfer, but not to worry, because it is a very good one. Colors are rich and bright, and black levels are spot on. If I had to nitpick, it would be a wee bit of grain, but not enough to whine about. This is the kind of sharp, colorful image transfer that makes me get goosebumpy about DVDs. A full-frame transfer is also included, for those allergic to seeing a film in its proper format. To paraphrase a line from MIB, Columbia makes this look good. Audio Transfer Review: Like the video, it's "same as last time" on the audio transfer. Columbia has included the same 5.1 mix found on prior releases, though it's surprising to find no DTS track as there was on the LE. Regardless, the 5.1 track is mixed aggressively with solid directional imaging and active rear channels, especially for Danny Elfman's kicking score. This track doesn't have that rib-tickling bass thump that DTS can offer, but it still offers plenty of rumble. Dialogue is anchored in the center, and is reproduced crisply. Well done. English and French 2.0 surround tracks are also included. Besides containing both the widescreen and pan & scan version of MIB, Disc 1 also houses two commentaries that can be found on earlier releases. The first (and best) features Barry Sonnenfeld and Tommy Lee Jones, with the ability to turn it into a visual commentary (MST3K-style), with silhouettes of the two participants at the bottom of the screen. It's a cool feature, and allows them to point and circle items on the screen (kind of like a television football game commentator). The track is divided into ten chapters, based on topics. Sonnenfeld has a dry sense of humor, and it comes across well on this track. He addresses a lot of production tidbits, and is refreshingly easy to listen to. Jones, who alternately sounds bored or hilarious, plays a good second banana to Sonnenfeld, and he gets off a few good quips. The second commentary is a technical commentary featuring cobbled-together segments of comments from Sonnenfeld, Eric Brevig (visual FX supervisor), Rob Coleman (animation director), John Burton (ILM CG supervisor) and a badly recorded Rick Baker (makeup FX), who sounds like he was miked in an echo chamber. This track is a bit dryer, and has a number of silent gaps. I always find it a treat to hear John Burton talk about technical elements, and I would have liked to have heard more from him. This gives you the ability to use the angle button on your remote to watch two scenes in various stages of completion. This kind of stuff doesn't appeal to everyone, but it is extremely fascinating to see how the various pieces can be put together. Sonnenfeld provides a video introduction, describing what the section covers, and the scenes can be watched in storyboard, bluescreen shoot, bluescreen composite, lighting & animation, and final cut. The two scenes are Tunnel Scene and Edgar Bug Fight Scene, and are available with an optional technical commentary. This piece traces the roots of the film, from its comic book origins to script changes to visual effects design. Most of the principals get to say a few words, but Sonnenfeld gets the most informative chunks when he chats about how overly complex some of the subplots were on the original script. There are quite a few bluescreen shots, as well as some editor's footage, which captures some of the cut out scenes concerning the abandoned subplot. I'm not a big fan of extended scenes, and these don't do anything to win me over. All told these extended scenes, presented as rough cuts with no music, don't really amount to much and last less than five minutes. The only moderately entertaining one is the Bouncing Ball clip, which has no special effects. After another Sonnenfeld video intro, you will have the option to examine various levels of animated character development for Mikey, Jeebs, and the Worm Guys. From a technical standpoint, this is one of the stronger supplements. Each character can be viewed in any of the following stages: Preliminary, Adding Skin & Texture, Animation With Lighting, and Final Character Composed Into Scene. This allows you the chance to view some morphing images that go from original concept art to completion. I found it fairly interesting to see a quick morph from line art to final effect shot. Characters featured are Edgar Bug, Jeebs, Mikey, Mr. Gentle, and Farmer Edgar. A traditional set of storyboards, for five scenes (Jeebs, Tunnel, Mikey Chase, Edgar Bug Fight, and Final Sequence). Sonnenfeld supplies another video intro to this fun section, where you get to edit together three separate scenes. Each scene consists of three shots, and each shot has three possible takes to choose from. You preview and choose what you like best, watch it and then compare it to the actual film. Standard bios for the main cast and production crew. It's trailer time, with theatrical trailers for MIB, Spiderman, Stuart Little 2 and an MIB II teaser. Will Smith and Mikey strut and pose in the music video for the title song. God, I hate this song. At six minutes, this is nothing more than a glorified promo piece, made even less enjoyable by an odd echo on the announcer's voice. DVD-Rom features include an MIB Training Center, that launches a discourse on a weapons overview, non-lethal MIB devices and an interactive game. Also included is a neat 3-D exploration of the hip, trendy MIB headquarters, as well the usual weblinks to Columbia TriStar. These extras are a step above the usual weak DVD-ROM features that most discs offer. Here's something new for this release. It's a 03m:15s behind-the-scenes puff piece for MIB II. Yep, it's a whopping three minutes, and most of it is footage from the included MIB II teaser. There is also a ten-page Deluxe Edition color booklet, designed primarily to hype MIB II. It's not necessary to make the upgrade if you already own the LE of MIB, but otherwise this is really a must own 2-disc set. The film is terrific, and the image transfer is just gorgeous. Even though Columbia has included all of the extras found on the LE here (plus a few new ones), the whole package is a winner, despite the lack of a DTS track.